CHARLOTTE, N.C. – June 30, 2014 – Mountain Real Estate Capital (Mountain), a leading private equity investor in residential land development and homebuilding, closed on eight investments in the second quarter. “Five of the transactions were with existing partners and we added three additional best-in-class developers and builders to our national platform,” shared Arthur Nevid, Mountain’s chief investment officer. Mountain committed $145 million to acquire a total of 3,000 lots and 1,000 acres to be developed in eight states. “We continue to be excited about the diversity of our portfolio and the repeat business with our existing partners,” added Joel Kaul, Mountain’s managing director who oversees a majority of the builder and developer relationships for the company. “We have been providing capital to many of our existing partners for over two or three years and they continue to provide a steady pipeline of off-market opportunities. 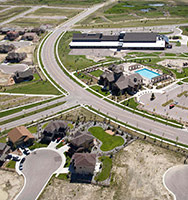 We recently closed on our 10th subdivision with one of our Midwest builder partners, our sixth deal with one of our west coast builder partners and our 12th transaction with our builder partner in New York City.” Over 90 percent of our investment portfolio has funded developer and builder partners with an investment program for repeat deals or a platform and entity investment. In addition to the firm’s existing builder partners, Mountain is developing and selling lots to more than 30 top 200 builders in our master plan communities and larger land projects across the country. Mountain is structuring these sale transactions to deliver pods or lots to builders with the most desirable structure for both parties. In many instances, Mountain is providing structured takedowns or option contracts over a couple of years. “Not only did we have another solid quarter but our pipeline for repeat business also remains strong,” added Fioretti. “We project that we will invest over $100 million in the third quarter. As the industry participates in the economic recovery we will expand to select markets around the country. We continue to look for residential real estate companies with a culture for success and strive to be the best at what they do while we provide them the certainty of capital to close deals. We have an entrepreneurial environment and are dedicated to high quality service which is supporting many of our partners to grow substantially over the next couple of years. We are excited about building upon these strategic relationships in 2014 and beyond to help them grow their businesses successfully,” said Fioretti.